A severe thunderstorm watch is out across Central Pennsylvania until 10 AM with a squall line of wind and rain but little in the way of thunder pushing east through the state. This will work towards us and cross the region later this morning. However, modeling does suggest that this line weakens a bit before it gets here. That said, the potential for gusty winds does prompt the Storm Prediction Center to issue a watch until 11 AM for the city and points north and west. Severe Storm Watch until 11 AM. Until the frontal line gets in and through the region, expect a breezy and at times windy go of things this morning in the Delaware. Rain will move through in varying levels of intensity, mostly light to moderate ahead of the front. Winds will gust to over 40 miles per hour ahead of the front, sustained in the high teens and low 20's...and it will feel semi-tropical out. Timing the front, it appears we should see the band approach the western burbs by 8 AM, crossing the city over the proceeding hours thereafter. With the band of showers, rain could pick up briefly in intensity with the front itself as will the wind. We could see some 50 mile per hour gusts locally but I think the best chances for that stay north and northwest of the city (where dynamics and storm support are a bit better). 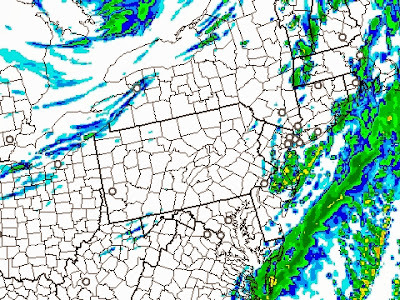 HRRR guidance for 9 AM showing what's left of the Fall Squall moving in. Guidance has been a bit slower than reality in terms of timing. Dynamics are stronger out to our west, which is allowing the frontal squall to strengthen across Central PA. Those wind dynamics aren't as 'good' here, which suggests the line should weaken a bit as it crosses the region. That said, the risk for strong winds will continue through the morning, with the frontal boundary band moving through between 9 and 10 AM in the city, 10 AM and 11 AM east of Philly. HRRR at 1 PM. Most shower activity has come to an end. By 1 or 2, most of the shower activity will be winding down through the region. Sunshine should break out west of the city, gradually working its way east through the balance of the day.